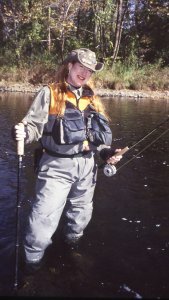 Is the Folstaf® Wading Staff Right For Me? If you need a staff for fishing or other water based uses, this is the staff for you. The Folstaf® Wading Staff, a foldable wading staff comes with a water-insoluble cork grip top, which will float on top of the water. In place of the wrist-loop found on the Folstaf® SUPER STURDY, there is a 6 foot long lanyard with keeper bead which can be attached to your wading belt. This allows the staff to float next to you when not in use, but keeps it immediately retrievable when needed. The Folstaf® Wading Staff, a foldable wading stick, has no wrap strap to hold the individual sections together - the staff is sold with a holster (an optional accessory in the walking stick line) which holds the staff in a closed position. This allows for instant retrieval of the staff when there is no time for unwrapping the wrap strap. 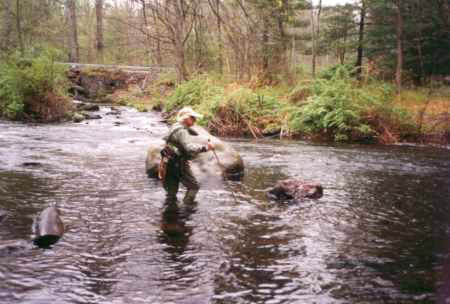 Folstaf® Wading Staff, built for safety and stability, will keep you safe in rushing streams and rivers. Not using your staff in water? Consider the Folstaf® SUPER STURDY heavy-duty folding walking stick outfitted for hikers and walkers.